← This Is Our Year! 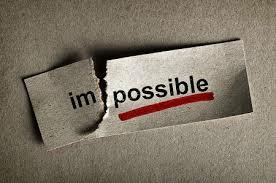 Sometimes we make some mistakes that seem impossible to overcome. We might put our roots down deep in sin, so much so that we can’t turn things around by ourselves. Never fear! We can’t mess anything up so bad that God can’t set us straight. No matter what you have done wrong, forgiveness is always available through Jesus. “Jesus replied, “What is impossible with man is possible with God.”—Luke 18:27. This entry was posted in Christian Living, Communion Meditations, Humor, Prayer and tagged forgiveness, illustration, impossible with man, Jesus, Luke 18:27, possible with God, sin. Bookmark the permalink.